HONG KONG, CHINA--(Marketwired - Jul 12, 2016) - Electrolux has agreed to acquire Vintec which supplies a wide range of freestanding and integrated climate-controlled wine cabinets under the Vintec and Transtherm brands throughout the Asia Pacific region. Announcing this today, Kenneth Ng, Head of Electrolux Major Appliances - Asia Pacific and Executive Vice President, said that the acquisition was a "strategic fit" with the company's major appliances business and comes as wine consumption continues to grow in the region, particularly in Asia. Mr Ng said the Australian market accounted for more than two-thirds of Vintec's annual sales of more than AUD22 million with Asia contributing to the bulk of the remainder. Asia, particularly, holds the promise of rapid growth because of increasing wine consumption and the low penetration of wine cabinets. He added that the wine cabinet business would strengthen the Electrolux focus on products which delivered "great tasting food" and a "remarkable consumer experience". Mr Ng said the Vintec operations in Australia would be integrated into the Electrolux ANZ business headed up by Managing Director, Mike Putt. The Singapore operations of Vintec which services the rest of the world, would be integrated into the East Asia business of Electrolux and report to Craig McEachern, Senior Vice President - Electrolux East Asia. Mr Laurent Ducourneau, who left his native Bordeaux in France for Singapore to import French wine into Asia, founded Vintec in 1993. In 1998 he created Vintec Australia in partnership with Sydney-based ex banker Jean-Marie Simart. Since then, Mr Ducourneau has managed the company's Asia business from Singapore while Mr Simart has managed its Australasian operations. Both will stay on to assist the integration of the Vintec business into the Electrolux Asia Pacific operations. 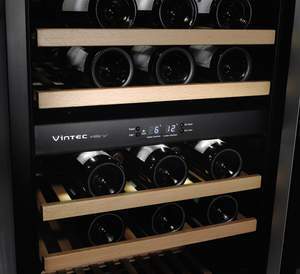 The 30 models in the Vintec and Transtherm product portfolio range from compact 30-bottle, under-bench and integrated wine cabinets to suit most domestic kitchens to large stand-alone 4000-bottle walk-in wine cellars. The Vintec acquisition includes Vintec Club which has grown rapidly to about 10,000 members since it was established three years ago. The club focuses on enhancing the ownership experience through exclusive winemaker dinners and degustations, wine education, wine recommendations and other related benefits and services. Mr Ng said Electrolux was focussed on profitable growth and the Vintec acquisition continued an Electrolux policy to seek out "adjacencies" or businesses which were synergistic with its core major appliances business. "This addition to our operations follows the very successful integration of the BeefEater barbecue business which we acquired in Australia two years ago," he added. "And it gives our key retail customers even more reason to deal with Electrolux because of our portfolio of leading brands in the household and hospitality areas."